The Browning Hi-Power is a notable handgun of the last century for a number of reasons. It was John M. Browning's final pistol design. It introduced the concept of the high-capacity double-column magazine. It is considered by many to be an improvement of the famous Colt Government Model of 1911. Finally, it is one of the most-used military service pistols of all time. In fact, during World War II the Hi-Power, also known as the P-35, saw service not only with a number of the allied forces but was also used by the German military. The fact that the Hi-Power remains in production today without major changes speaks volumes on the soundness of its basic design. Although the P-35 is often called the Browning Hi-Power after the legendary American gun designer, its country of origin is in fact Belgium. It is a product of that country's huge arms company Fabrique Nationale, often referred to as FN. FN was created in 1889 by a consortium of Belgian financiers to manufacture Mauser rifles under license for the military of that country. Ironically, Ludwig Lowe of Germany helped the Belgians set up the machinery and factory. Lowe is best known for his involvement in the development of the Luger pistol. The Mauser rifle production did not provide the profit margin anticipated by FN's backers so the company began to look for other products to manufacture to increase profits. FN began producing sporting rifles, shotguns and bicycles. These did not take full advantage of the company's production capacity. During the late 1890s FN came in contact with John M. Browning. At the time, Browning was working with Winchester but was dissatisfied with that company over the manufacture of one of his shotgun designs. FN showed great interest in the shotgun and also a pocket pistol that Browning had designed. The company began production of the latter, completing the first pistol in 1899. The pistol was a success, and it began an association that was to last until Browning's death in 1926. Belgium became Browning's second home, where he and FN collaborated in developing a number of successful firearm designs. Some four years before he died, Browning was working on a 9mm semiautomatic project that proved to be his final pistol design. Browning made several prototypes, but the design was incomplete before he died. The project was completed by his protÃƒ©gÃƒ©, Dieudonne Saive, and the final design became known as the Modele 1935 pistolet autamatique Grand Puissance, or, in English-speaking countries, the Model 1935 High Power pistol. This designation was later changed to "Hi-Power." Many 1911 adherents view the Hi-Power as Browning's ultimate design, one that simplified the Colt .45 Government Model and corrected what few faults it has. It is certainly true that the Hi-Power does share many of the 1911's characteristics and has a similar appearance. (Top) Old internal extractor. (Bottom) New extractor. Like the 1911, the Hi-Power is a locked-breech semiautomatic pistol that has a single-action trigger. Instead of the 1911's swinging-link barrel-locking system, a simpler cam-operated action is employed to unlock the action immediately after firing. While the Hi-Power has an exposed hammer and the same slide stop, magazine catch and thumb safety as the 1911, the grip safety is absent. Instead the pistol has a magazine disconnect that disables the action when the magazine is removed. The stirrup type of trigger used on the 1911 is replaced by a connecting bar contained in the slide. The latter is a lever that releases the hammer when activated by the trigger. Perhaps the pistol's most unique feature is its 13-round, double-column magazine. It was Browning's intention to retain a single-column magazine because he was concerned about the reliability of the double-column type. It was Saive who decided to use the double-stack magazine. 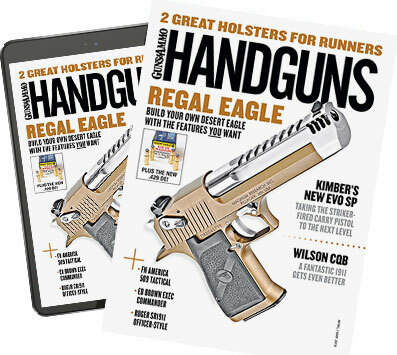 The amount that the higher-capacity magazine adds to the width of the grip is surprisingly small and does not detract from the pistol's handling characteristics. While the Hi-Power is a simpler design than the 1911, its trigger cannot be custom tuned to the same extent. In addition, the thumb safety of the original models is small and stiff to operate. This has been improved on the current models. The Model P-35 is one of the most widely used military pistols of all time. When it first appeared, it was immediately adopted by the Belgium military. Later, sales were made to Estonia, Lithuania, China, Peru and Romania. World War II interrupted further foreign sales. When the Germans invaded Belgium, FN management refused to work for them. The factory was confiscated, and German management was installed to run it. Over 300,000 Hi-Powers were made for the German military. These pistols were designated as the Pistole 640(b). The British, Canadian, Chinese and Greek forces used Hi-Powers made by the John Inglis Co. of Ontario, Canada. Hi-Powers were generally issued to Special Forces such as airborne and commando units. After the War, FN resumed production of the Model 35. Postwar military pistols are designated as the Model 1946, while the civilian models are called simply the Hi-Power. The British Army adopted the P-35 as its official pistol to replace the Webley and Enfield .38 revolvers. Other countries also adopted the pistol for their military forces, including Argentina (where it was made under license), Denmark, Holland and Rhodesia. The Hi-Power today remains little changed from the original pistols of 1935. Some of the first models manifested a tendency for the internal extractor to break. This was corrected by replacing it with a short, more rugged extractor. The first Hi-Powers were made with either fixed or adjustable sights. The latter was a tangent-type rear assembly. Post-war civilian Hi-Powers included a sports model that featured a small, fully adjustable rear sight. Early Hi-Powers all had a round-shaped hammer. This was replaced with a spur-type hammer in 1972 for pistols that were imported to the U.S. Many military models were made to accept a detachable stock that also contained a flap holster. During the war, the Inglis Company experimented by machining scallops to the slide of the pistol to make it lighter, but it was never produced in quantity. Hi-Power finishes vary from profusely engraved presentation models to drab, Parkerized military-issue guns. Civilian models usually have a bright, polished blue finish. Late German Hi-Powers often have a very rough, gray Parkerized finish with much evidence of machine marks. Allied wartime model 35s usually have a matte Parkerized finish, although some may also have a black paint-like coating on the slide. All post-war U.S. Hi-Powers were at first made with checkered wooden grip panels. Starting in 1986, grips made of black-checkered plastic were offered. FN continues to make the Hi-Power much as it was in 1935. Changes include a spur hammer, larger ambidextrous thumb safety, form-fitting black plastic grips with a built-in thumbrest and external extractor. The Hi-Power remains in service with a number of armies even to this day and has been used by FN as a platform for double-action, fast-action and compact versions. Elsewhere in this issue is my review of the modern version currently imported by FN.